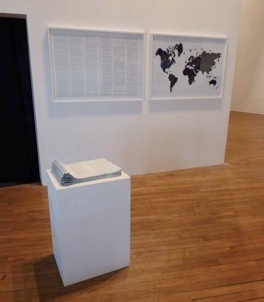 By borrowing from the vocabulary of geographical and economic mapping, the ephemeris Ghost Towns, a print in A2 format, presents on the one hand a map of the world locating several hundred ghost towns all over the planet and, on the other, a sequence of short paragraphs explaining the circumstances in which some of them have been abandoned. An essay by Marc Augé, Ghost Towns, written for the Libelle* project, is stuck onto the sleeve that contains the print. In Amiens, as part of Suspended Spaces#1, a front and back of the print are enlarged, framed under glass, and affixed to the wall. In front of them, a pile of sleeves, on a stand, is available for visitors. Berger&Berger draw up a non-exhaustive inventory of more than a thousand towns. In the captions, the towns are pigeonholed in five categories which refer to the nature of the causes leading to these towns being deserted: geopolitical, natural, economic, social, and environmental. 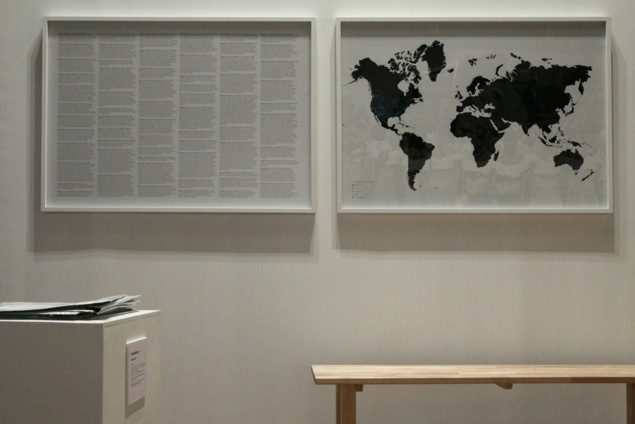 This map depicts the world in the negative, through disappearances. The sampling of ghost towns which Berger&Berger has chosen to present on the front of the map stresses the diverse histories of each one, as well as the diversity of the historical periods in which they vanished. No government organization, and no geographer, has come up with a worldwide census of abandoned towns, because there is no use for such a work. It is perhaps because this cartography does not respond to any scientific, military or economic function, that it is part of an artistic approach. The map of Ghost Towns emphasizes the fact that the very idea of a ghost town is bound up with certain cultures, and is probably part of a western, and in particular Anglo-Saxon mythology. Because if it can be supposed that this phenomenon has occurred on every continent, the western countries—above all the US and the UK—present many abandoned towns, while other continents seems exempt from the phenomenon. *The work Ghost Towns was created as part of the Libelle project in the form of 30 numbered and signed copies printed in A2 format, and 1,300 copies presented in the form of works that are freely available. The complete set of copies is printed on Polyart synthetic paper, and published by Rosascape. For the exhibition Suspended Spaces in Amiens, 1,500 additional copies have been printed in French, along with a large novel double printing.